As Border Restrictions Tighten, Some Experts See Migrant Caravans Growing In Size Mexico has begun allowing members of a mass migrant caravan to cross its border, following violent clashes between the migrants and Mexican police on Friday. Thousands of migrants attempted to cross the border from Guatemala into Mexico this week. 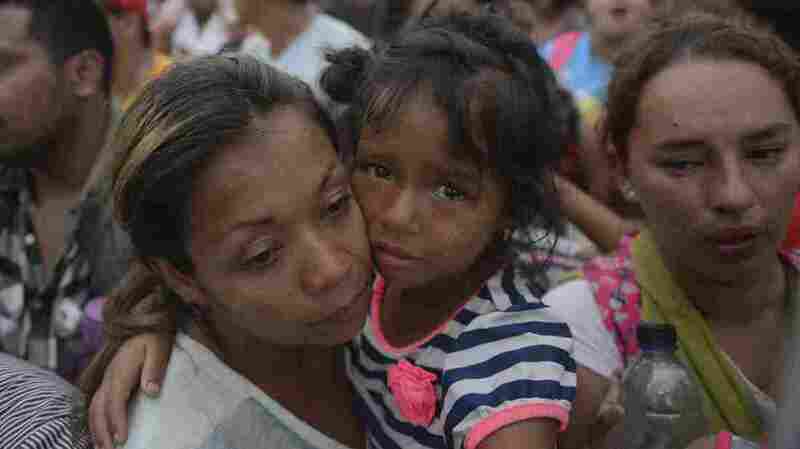 Many of the migrants have reportedly returned to their home countries of Honduras and Guatemala. Guatemala's president says 2,000 migrants have returned to Honduras following a tense standoff on Friday between the mass caravan they had been traveling in and officers on Mexico's border with Guatemala. The president of Honduras said another 486 members of the convoy were also en route back to Honduras, according to Reuters. The migrants were part of a group of thousands that attempted to cross a border bridge over the Suchiate River along the border between Guatemala and Mexico. Many of the migrants had given up waiting on the bridge, and trekked across the water using ropes and rafts. Violent clashes erupted on Friday when thousands rushed across the bridge, and were met by Mexican police officers armed with riot gear and pepper spray. Mexico has said it will allow only migrants carrying valid passports and visas to enter. On Saturday, officials there began accepting small groups for asylum processing and granting some 45-day visitor permits, according to the Associated Press. An estimated 4,000 people made up the group waiting to cross into Mexico this week — a reflection of what Elizabeth Oglesby, a professor at the University of Arizona's Center for Latin American Studies, described as the growing size of migrant caravans. According to Oglesby, as border restrictions have tightened, the journey for migrants has become more expensive and dangerous, increasing incidences of extortion and the trafficking of women and children. She says migrants have begun banding together in caravans for protection. "The migrant routes through Mexico are increasingly controlled by organized crime in Mexico, and they prey on Central Americans. They extort them for money," Oglesby said, "They sometimes force them to work as couriers for drug trafficking. There are high levels of violence, especially against women crossing through Mexico." Such violence along these routes was much less common 20 to 25 years ago, according to Oglesby. "It used to be that Central Americans would cross with people from their same community. They would go to Mexico; it wouldn't cost so much. The more the U.S. border has become militarized, the more migration has become the realm of organized criminal elements in Mexico, the more expensive it is for Central Americans, the more dangerous it is for Central Americans and the more that we're going to see these caravans that are a form of protection for Central Americans as they cross through Mexico," Oglesby said. On Friday, Secretary of State Mike Pompeo called illegal immigration a "crisis," and insisted that migrants must be stopped before reaching the U.S. border. Pompeo was in Mexico City to meet with Mexican President Enrique Peña Nieto and Foreign Minister Luis Videgaray Caso. In a joint press conference, Videgaray said the migrant caravan that massed along Mexico's border with Guatemala this week is "a challenge that Mexico is facing, and that's how I expressed it to Secretary Pompeo." "You can tell Mexican security forces are preparing because there are dozens of police in riot gear waiting here for the imminent arrival of this caravan." Most of the migrants who had gathered there were from Honduras, but there were also people from El Salvador and Guatemala, Frederick said. Guatemalan President Jimmy Morales held an emergency meeting with his Honduran counterpart Juan Orlando Hernández to address the situation on Saturday. According to The Washington Post, "The leaders said an estimated 5,400 migrants had entered Guatemala since the caravan was announced a week ago, and about 2,000 Hondurans have returned voluntarily. Both leaders had spoken by phone with Peña Nieto and U.S. Vice President Mike Pence to discuss humanitarian aid and efforts to help people who want to return." Earlier this week, President Trump tweeted that he will send U.S. troops to close the border with Mexico if the group of migrants is not stopped. The Washington Post reports the number of migrant parents entering the U.S. has recently surged to record levels. "Border Patrol agents arrested 16,658 family members in September, the highest one-month total on record and an 80 percent increase from July," according to The Post. President Trump has seized on immigration as an issue ahead of next month's midterm elections. On Saturday, he tweeted about the "horrors taking place on the border," and urged Democrats to work with the White House on a solution.